BentoLunch.net - What's for lunch at our house: Season's Eatings Holiday Hop! It's time for a fun little bento hop again, this time helping you to prepare for all your season's eatings! The kiddos were on board with seasonal lunches and I opted for our Planetboxes to show how much food really fits in the Shuttle and Rover. Keep in mind, the kids basically have the same lunches. 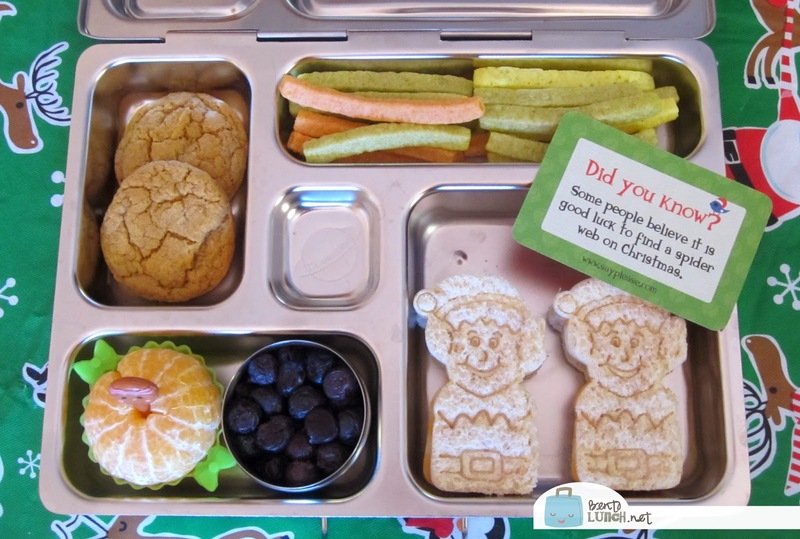 Ben took Elf on the Shelf themed ham and cheese sandwiches on honey wheat, along with a Cutie orange, some frozen blueberries (packed in a dipper for safe keeping), a couple of pumpkin cookies and some veggie straws, all packed in our Planetbox Rover. 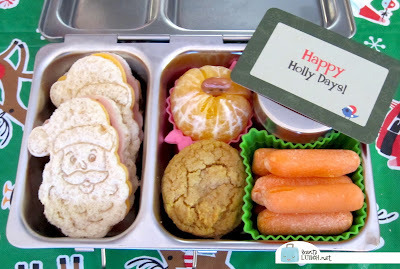 Faith opted for Santa sandwiches, also ham and cheese on honey wheat, a Cutie orange and pumpkin cookies too. In lieu of the veggie straws, she took carrots, and her little dipping container is filled with French dressing for the carrots instead of blueberries. Her lunch is packed in a Planetbox Shuttle. That said, we've got generally the same amount of food--carrots replacing veggie straws and different fillers in the dipping container, but both lunches fit in their respective boxes just fine! 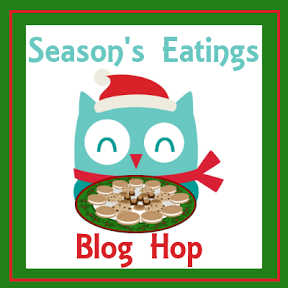 Now since this is a blog hop, I invite you to click the awesome owl below and visit my friend Cristi over at BentOnBetterLunches! 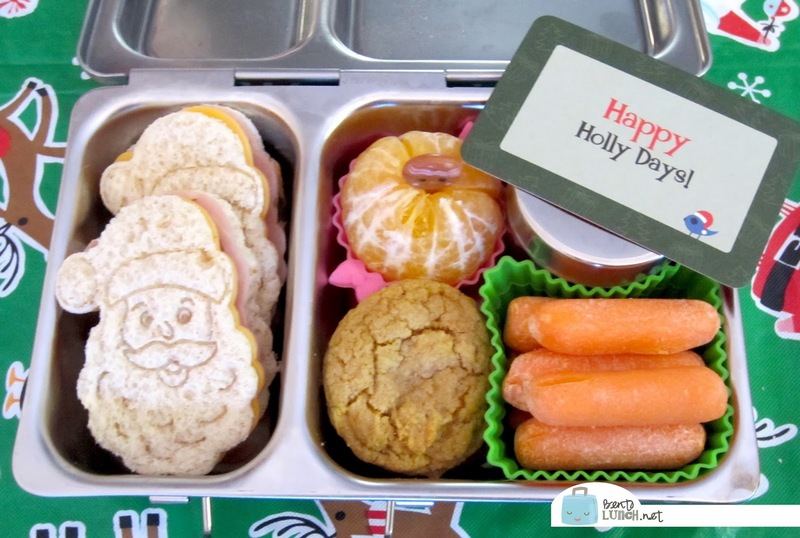 Interesting comparison and such cute and festive lunches! I love both of those stamps, so cute! These sandwiches are adorable! I can't wait to start building up my bento/fun lunch supplies...is there a trick to using the stamps? These are the press style cookie cutters. I'd recommend using a softer bread (this is Sara Lee Honey Wheat). I warmed it about 5 seconds in the microwave because it had been in the fridge. Cut the top piece of bread separately and press down hard, which leaves a better impression than trying to cut a whole sandwich. the sandwiches are so cute!! These are both adorable!! The sandwiches are too cute! I need to get those cookie cutters. The elves look so cute.